PLEASE READ ALL THE Q AND A PAGES BEFORE REGISTERING. Last day to register for Convention sponsored walk and bus package is May 14th. The Empire State Capital Volkssporters of the Northeast Region are delighted to be your hosts for the 21st biennial AVA convention. Other Northeast Regional clubs are partnering with us to offer you walks in places full of history and charm that extend from the Atlantic Ocean to the Great Lakes. For the convention days we are planning entertainment in the evenings and a series of workshops featuring both volkssporting topics and local history. 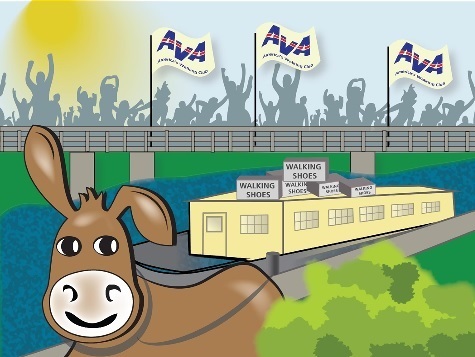 Our mascot, Sal the mule, bids you to come to Albany to be an active convention participant to meet volkssporters from across the U. S., Canada and beyond and to share in the camaraderie of volkssporting. Please check these pages often as information will be added as we get closer to the June 2019.